SSG Catherman. OIF I, 2003. Somewhere in Iraq. Fieldcraft. Technically, this military term refers to surviving life in the field, undetected. It's camouflage. It's movement and observation. But my Army buddies and I used this term much more loosely. 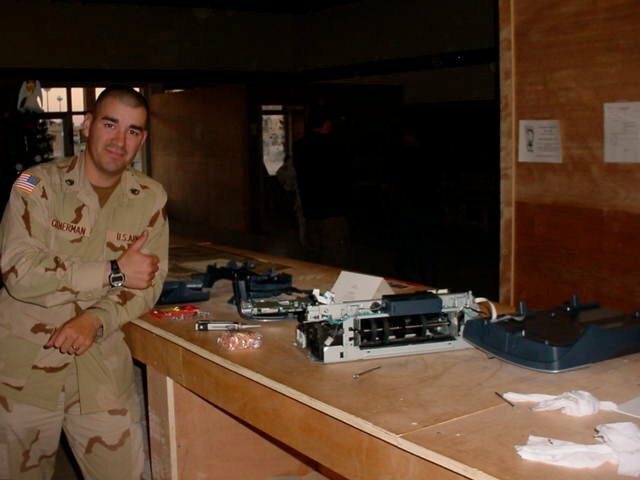 I was in OIF I (the first year of the Iraq War). For us, fieldcraft included unique ways to get supplies, often by bartering with the local economy. It included ways to get things done when there were no resources available. It was stretching things beyond their life expectancy. Fieldcraft was finding ways to use things beyond their intended use to make it happen. It was mission first, no matter what. When we found a way to install a sit-down toilet in the hootch and we found a sit-down toilet in Iraq . . . fieldcraft. The water heater we wired up and the poncho curtain we use to get in a warm shower, that was fieldcraft too. The cast-iron plates we made to hang on the ragtop HMMWV doors fit the bill. So did daisy-chaining rat traps. So did an RC car "IED disrupter." Using whatever we had to the extent of ingenuity and creativity required to get the mission done we lumped into the term, "fieldcraft." I had a color printer/scanner. I needed it for missional operations. Color photos were very helpful for specific missions. However, in the winter, mice would nest inside it, probably cuddled up close to the power supply trying to stay warm. When I fired up the printer, it became a $300 mousetrap. The printhead ran across the track and crushed a mouse in the gears until it ground to a halt. The printer was shot. So was the mouse. Considering where we were, supply lines, and the significant combat operations still happening at the time, I figured it would take weeks to get a new printer and that was weeks too long. The mission had to continue and we needed the printer. What to do? I thought it was a fluke the first time. When it happened again, we had to devise a way to keep the mice out but still allow the printer to open and allow it to feed paper. We ended up with an elaborate trap door, made with things we could scrounge up. Would it have just been easier to cut the power when the printer was not in use? Yes. But was that as awesome? Not at all. Fieldcraft during OIF I was not always this silly. My entire battle rattle utilized fieldcraft to ensure I was the best equipped I could be when things lit up. We ran 550 cord in our vehicles in such a way to be able to slide the radio to speak but let it go without losing it or having to rehook it. It was faster and sometimes 'faster' was a matter of life and death. We put antennas on every vehicle in a convoy and stuck tent poles out every window. Our guys got ambushed far less than those who didn't use this kind of fieldcraft, and we were outside the wire just as much, if not more. Why? Fieldcraft. I wouldn't have imagined how valuable this skill would be in ministry. As a missionary planting a church in an unreached mission field, I have to use fieldcraft all the time. It looks a little different but the principle is the same. Our resources are very limited. The mission is great. We need to put everything we've got into the very best we can do in order to move the mission forward. This is what it looks like when God says, "Plant a church in Utah." Brett, a co-laborer in this ministry, figured out ministry fieldcraft rather quickly. He's moving away, so now I'm trying to train Sarah and Zak in the ways of missionary fieldcraft. I think they both get it and Sarah has already had opportunities to demonstrate her fantastic fieldcraft skills. They too are going to make a great staff team of missionaries. Sometimes our church gets a little tired of fieldcraft. I don't blame them. They ask why we can't do something the same way a big church in the South might. Or like the way church plants do in Christian contexts, where there are lots of Christians. I get it. Sometimes I get tired of it, too. But then we are reminded of the lostness in this place. 98% of our community does not have a saving relationship with Jesus--the Jesus of the Bible. And we don't have the resources. We're scraping, scratching, and scrounging for every resource to make the mission go. It's not ideal, but the mission is too important. It’s getting the gospel to people who need to hear. Eternity is at stake. So we use fieldcraft. Lots and lots of fieldcraft. Mission fieldcraft. Until the mission is done.